Fiji Cooperative Dairy Company Limited Chairman, Simon Cole at the FCDCL Annual general meeting held at the FMF Gymnasium in Suva. The Fiji Cooperative Dairy Company Limited (FCDCL) is proposing constructing its own processing facility. This is despite having a 20 per cent share in Fiji Dairy Limited. 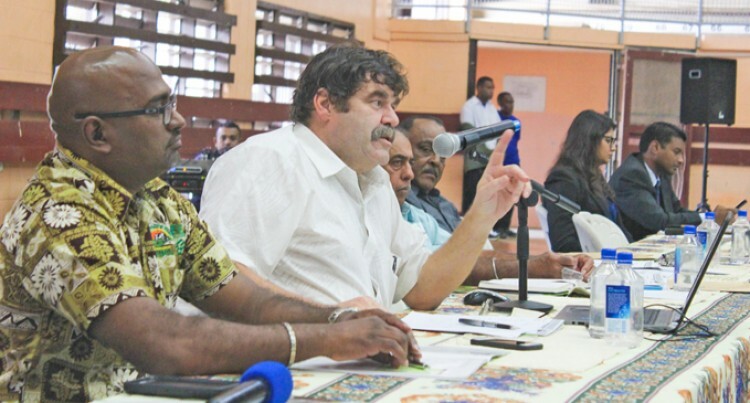 This was discussed during FCDCL’s annual general meeting held at the FMF Gymnasium in Suva on June 10. FCDCL chairman, Simon Cole, said this decision was reached as an alternative if the Milk Supply Agreement with Fiji Dairy Limited was not reached. The Milk Supply Agreement proposes to revise and increase the pricing of raw milk to farmers from $0.82 to $1.25 per litre. Mr Cole said they have made some progress with the Milk Supply Agreement and are confident it will be put in place soon. Despite the statement claiming general overall consensus from members present, some dairy farmers the Fiji Sun spoke to who were present at the AGM were not generally happy with the way the meeting was conducted. A few farmers stressed such meetings are supposed to allow members to speak, however, this was somewhat restricted. One farmer, who spoke on the condition of anonymity, said the decision to invest in a processing plant was done without much discussion and the voting was quickly done. The farmer said only those who agreed, their vote was counted, however those who didn’t, no time was given for them to explain why they didn’t agree. The farmer went on to say it made no sense to invest in another processing facility when they already are 20 per cent shareholders in Fiji Dairy Limited. This would essentially mean FCDCL is competing with itself. A few farmers also raised concerns that the board and management did not talk to farmers/members enough and neither got their opinion. More than 150 dairy farmers are said to have attended this second AGM of FCDCL. The New Zealand government received praise from the farmers for their continuing support of the industry. This has included the purchase of tractors, improved chilling facilities and in providing an extension strategy officer to help develop the extension strategy. Mr Cole said the industry was grateful to New Zealand for their involvement and look forward to further developments into this and next year.